LakersGround.net :: View topic - Favorite Showtime Lakers Championship? Posted: Fri Jul 06, 2018 10:41 am Post subject: Favorite Showtime Lakers Championship? Feeling a little nostalgic and needing a pause from all the free agency chaos. I was born in 1989 and never got to experience the Showtime Lakers dynasty, so I thought I'd ask the fellow LG'ers that were fortunate to watch them play what their favorite championship was of that era. I would imagine the '85 team that beat Boston in the Garden was the sweetest, but I'm sure they were all great in their own ways. 1988. The Jazz. The Mavs. The Pistons. I will go with 1985 for the mere fact that we beat Boston for the first time. And to make it even sweeter it was on their floor. I feel like this was the strongest one of the bunch. I put that team against any in history and I like my chances. Always great when we beat Boston but there was just something special about that 1980 championship. It was just so unexpected. Rookie point guard, the games weren't live but tape delayed (That actually added some mystique), the disappointment when Kareem couldn't play game 6 and probably not game 7 if it had gone that far, and that performance by Magic in game 6. Special stuff. I see votes for each title except 1982. I wonder if Laker fans were disappointed in 1982 that they were playing the Sixers instead of the Celtics for the championship. 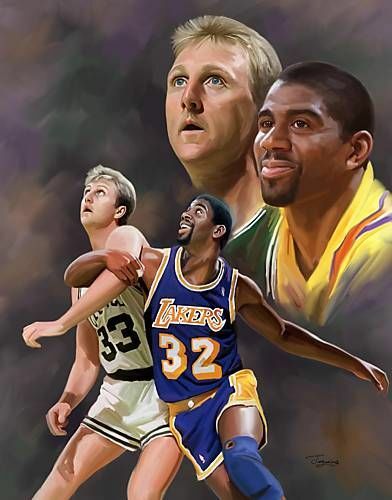 I guess the '80 win for me is the one, with all that it hinted at for the future: with Magic so strong and energetic, Silk at his peak and Kareem still mobile and not yet showing much serious decline. This championship shut a door on my Laker angst of the late '70s and emphatically signaled the end of the troubled years for all Laker fans after Jerry West's retirement. The One. The '82 title was a little bit greater still for the franchise in some ways, but given as how the '81 team had stumbled so surprisingly playoff time, the second Showtime championship just felt a little bit short of the same exhilaration. We could be beaten via our own faults, complacency. 1985 was special and great for it being produced against Boston and sealed in Boston. By the time the '88 championship was booked, the Lakers had come to be looking very vulnerable after '87, and they proved so the next year. The charm and effectiveness of the Showtime team had been worn down from the brutally physical play which was coming to dominate the league for the next few years. 82 doesn't have an iconic and defining moment like the others. The thing I remember the most was that Norm Nixon was ballin out. They were all great, but 1985 for those of us that were old enough to remember it was truly special due to the history. If you check out Kareem's reactions as the Lakers clinched for instance, you would see an animated Cap all fired up well beyond his typical laid back demeanor. What a win that was, but honestly they were all sweet as hell. I gave the nod to 1987 cause it was a good time. But the one that had my nerves all bad and my pressure all up was 1988 (7+7+7). 3 consecutive 7 game series...They took us through it that year. Boston for the first time. Destroying Bird, McHale, and the rest of the Celts in Boston Garden, especially after the Memorial Day Massacre, was my fave. Ditto. It was GUARANTEED by Riles. Of those three 7 game series, I think the Jazz scared me the most. Because it was the 2nd rd. Back then you thought Lakers do not struggle in the 2nd round. LOL! That was just how good Stockton and Malone were early on. Jazz went to back to back finals 9 yrs later. I always wonder what the hell happened in between? They wasted a lot of Malone and Stockton's prime years. They cemented their place atop the basketball world.